In a large skillet, heat the oil on medium high heat until it starts to smoke. In small batches, brown the beef on all sides, set beef aside to cool. In a large gallon size freezer safe zip-loc bag, put all the ingredients in the bag. When the beef has cooled completely, add it to the bag. Squeeze the air out, label the contents and date. Layer the onion and celery in the bottom of the crock pot, then the meat, tomatoes, peppers and bay leaves. In the reserved tomato juice, mix the tomato paste, chili powder, oregano, bouillon and salt and pepper to taste. 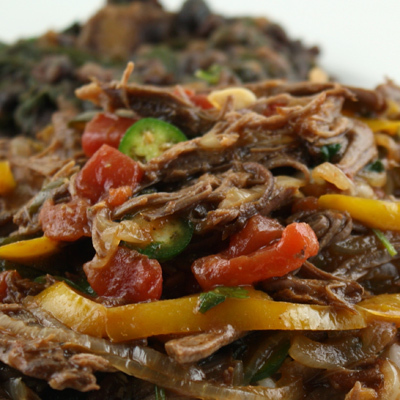 This entry was posted in Beef, Entrees, Modified Profast (Fast and Flexible) Recipes, Nutriplus Recipes (Balance Your Pyramid), Slow Cooker and tagged beef, crock pot, metabolic diet recipes, Metabolic Medical Center Recipes, peppers, slow cooker by foodies4mmc. Bookmark the permalink.